Waterline Boats offers display moorage for our brokerage boats at our docks on Westlake Avenue on Lake Union. In the heart of Seattle's "yacht broker's row" moorage here means that your boat will get seen! 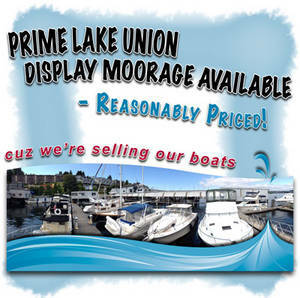 Inquire about our discounted moorage rates for sellers who list their boats for sale with us. We also offer an economical monthly washing program and can provide a variety of other services to ensure that your boat shows and performs at its best.